I once knew a guy who kept an actual database of all the women he dated so that he could always remember the relevant details about them and prevent awkward mixups. The DateMate iPhone app would've been ideal for him. The basic idea of DateMate is that it allows you to enter details about your partners—birthdays, contact information, silly things that you should recall—and track your encounters with them. The app offers a calendar so that you can keep track of whose bed you were in on which night and a way to rank the dates and create notes about them. Once you've got a bunch of dates under your belt, you can even generate graphs of your activities and compare frequency, quality, and progress. 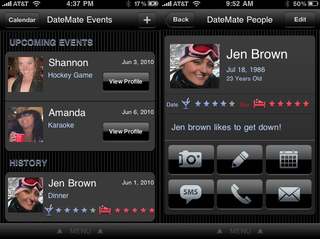 DateMate may seem a bit sleazy to those of us who prefer monogamy, but it appears to be a well-designed app that might make life easier for those who have somewhat open arrangements with their partners.